What most people that don’t own a business or take credit don’t realize is that my fees can be based on what type of card is used to pay for a transaction. If you have a high mileage giveaway card then I have to pay a higher rate. As much as 1% higher. While I appreciate the customer that spend $12,000 with me, the 3.5% Visa transaction cost on that particular card is expensive. If that person would have paid with a normal card it would have only been 2%. I am essentially giving him the miles but he think the card issuer or Visa is. Visa argues they are taking all the risk. I don’t mind paying for the risk. I just don’t want to pay for somebody’s trip to Florida. It gets worse with Debit cards. Why? Because I felt the risk for the bank and V/MC is even less. They can see immediately if the account has a balance. Sure the chance of fraud is there but there already is a separate fraud charge insurance fee. But the fees are starting to turn in my favor. Starting tomorrow, the interchange fee for debit cards(the bare minimum fee before the middleman aka merchant services company/clearing house) is moving down to 21 cents maximum plus a .01 cent possible fee for fraud prevention. The old fee was .44 cents. While this may not seem like a big deal but when you multiply it out times a few million dollars it ads up. It has become very obvious who was making money on the credit card fees. The banks. Now that they can’t get the money from me they need to get it from someone. They decided to take it from you. Starting with Bank of America and eventually trickling down to all other banks, eventually you will soon see a monthly charge for your debit card. Right now the fee appears to be $5. It will be different for different accounts but it has become obvious that if you don’t make banks enough money they will charge you for their services. I have actually financially benefited in more ways than I had originally planned. As soon as I heard that of the upcoming changes I went out and got bids on my credit card services. I figured with the drop in rates that I should certainly get a drop as well. I truly think that many credit card services won’t lower their rate despite the interchange drop in hopes that the small businesses won’t be informed enough to ask why not. I forced the issue asking what the new rate would be and sought a completely new rate package. The result was more than I thought. I found a company that was willing to give me a flat fee across the board on my cards, regardless of debit or credit or type of bonus cards used by my customer. They analyzed my past years overall use and types of cards and got my fee below 2% fixed. No matter what that is my rate. No pin numbers, no worrying about what card is used. They were willing to take the risk on what types of cards came through and hope that I had more debit cards and less airline cards. This was a drop of .3 percent from years past. I had gotten killed with high end frequent flier cards in the past 5 years. I had landscape customers and even worse, wholesale customers, paying for $30,000 jobs on a credit card. It was costing me $1000 out of my own pocket just to take the card as opposed to them writing a check. And why wouldn’t they use it? It costs them nothing and they get free stuff for doing it. You may say just don’t take it or raise the price. As a business owner you hate to lose a hard earned customer over a few percent and people are so price conscious it’s become very difficult to raise the price at all. You really don’t have a choice. At some point something was going to have to give. Right now its debit cards and their fees. The next round is getting rid of the free miles and gifts. If anyone is going to give away stuff let it be the busineses themselves. We’ll pay for the fraud protection and the services but the days of the free iPods are going to end soon. There may be a day when you have to pay to use your card again like the old days of American Express. Why? Because nothing is free and the people that have been paying for things is shifting. And you can bet your bank is going to be one of them. Just wanted to clear up a few things on your story. 1. “There may be a day when you have to pay to use your card again like the old days of American Express” Old days? We have several amex cards and earn mileage/membership rewards and NONE are free. Annual fees have always been applied to AMEX cards and range from $55 Green to $75 Gold to $500 for the platinum card. The only card that is fee free is the Blue card because they charge APR and don’t require payment in full each month like every other offering from AMEX. 2. “Starting with Bank of America and eventually trickling down to all other banks, eventually you will soon see a monthly charge for your debit card. Right now the fee appears to be $5” We also have several BofA accounts and if the fee is implemented on our card we’ll just cancel the debit card, pay with a BofA credit card that is linked to the account and just setup auto payments so the account is paid in full each month resulting in zero fees and even better, a 30 day interest free float. As opposed to paying $60 monthly and seeing a debit as soon as the card is swiped as a debit. I take credit cards and I understand your concerns. But, to be honest Shane, if I was a client of yours and read this, I’d never do business with you again. Your rant, as noted above, appears to lay the blame ‘the customer’ for using these credit cards that cost you money. So now you’re glad ‘they (your customers) should pay’ for the perks some bank or company offers on their credit cards, that they more than likely ‘never even knew’ that businesses taking credit cards get charged varying fees for in the first place!! Yep that’s it, blame the average individual for not knowing who pays for the behind the scene charges, when using a credit card, not the banks who do the actual charging and adding of fees. Curious, have you / do you, ever ask customers not to pay with credit cards, and explain to them how you are the one suffering when they do?? 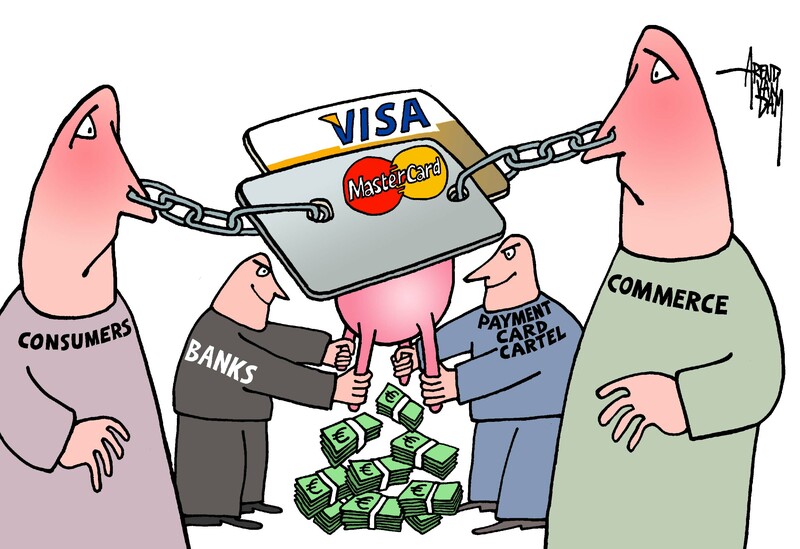 Seems to be some of that TP crap of – ‘it’s ones self responsibility’, for their not knowing how credit cards and rewards cards fees are accessed and to whom, not the poor struggling scamming banks and businesses who hide behind the thick fine printed legalese to do it. I can see why you’d be glad to have less credit card fees, but to blame ‘the customer’ as the culprit of it..? Well, at least you’ll make more money. I admit this came across as against the consumer. I guess I was only trying to point out that consumers think that the perks are all free and don’t realize who is actually paying for the bonuses. Thanks for the comment. I never forget the most important part of my business and that is the customer. I probably angled this story unfairly. Shane, your beef should be with the credit card company not the consumers. As consumers, we want to get the biggest bang for our buck. And, if you and/or the bank/credit card companies benefit in the process so be it. 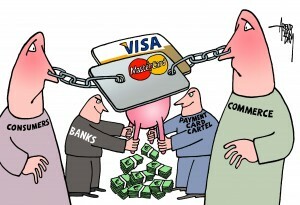 If you don’t like the fee then don’t accept credit card, plenty of your compeitors are more than willing. Haven’t used a debit card in years. I always use credit cards, even though the money is sitting in the bank. A user is better protected with a credit card; I don’t even carry a debit card anymore because if it’s stolen, I have little or no protection. Now I’ll have to convince my husband, and a $5.00 fee will do it. I have no problem using a credit card to pay for my groceries. When doing business at a small business I frequent, I always write checks; I try to be cognizant of fees. I’m sure other banks will soon follow. I wouldn’t be surprised if banks continue socking it to the vendors as as well. I don’t think you’re off any hook, Shane. Anyway, it will be interesting to see how consumers react. Shane, curious what the average cost is to process a via debit instead of a CC. Would this change not mean a possibility that far less consumers use debit and choose to use their Credit Cards with rewards and no monthly fee [this is actually what the Bank’s are encouraging] Won’t this just raise the cost for merchants if a much higher amount of transactions are being processed via reward credit cards? Either get into the cash business and risk getting red flagged by the IRS, or pay the insurance premium in the form of a credit card transaction fee. Either way…the consumer has nothing to do with your profit margin. I think you are barking at the wrong audience. I love your blog…but this post is really incoherence.